They are agreements between the United States and other countries that create open, competitive markets for international air travel. They enable airlines, not governments, to make decisions about routes, capacity, frequency, and pricing of their services, based on market demand. Open Skies agreements promote competition in the aviation sector, increase choice, and reduce costs for consumers while also facilitating exports for U.S. businesses and enhancing U.S. national security. Since 1992 the United States has entered into more than 100 Open Skies agreements with countries ranging from Germany and Singapore to Chile and Uganda. 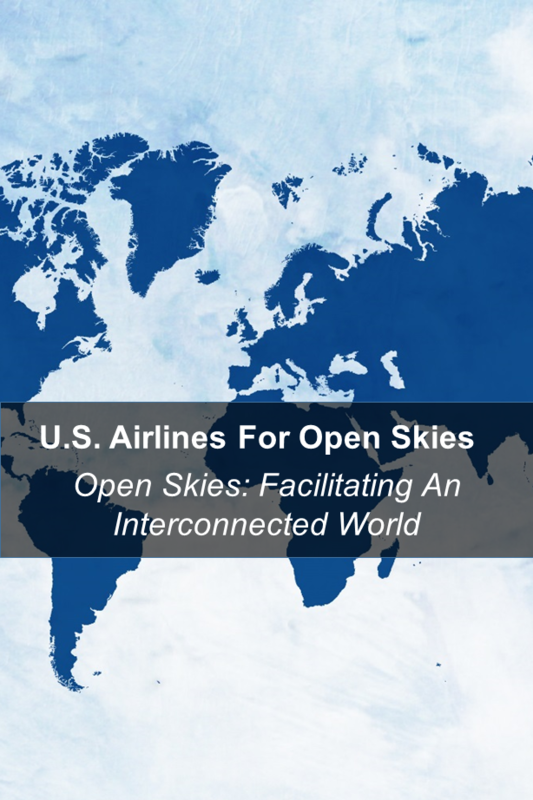 For a full list of the United States’ Open Skies agreements, click here. 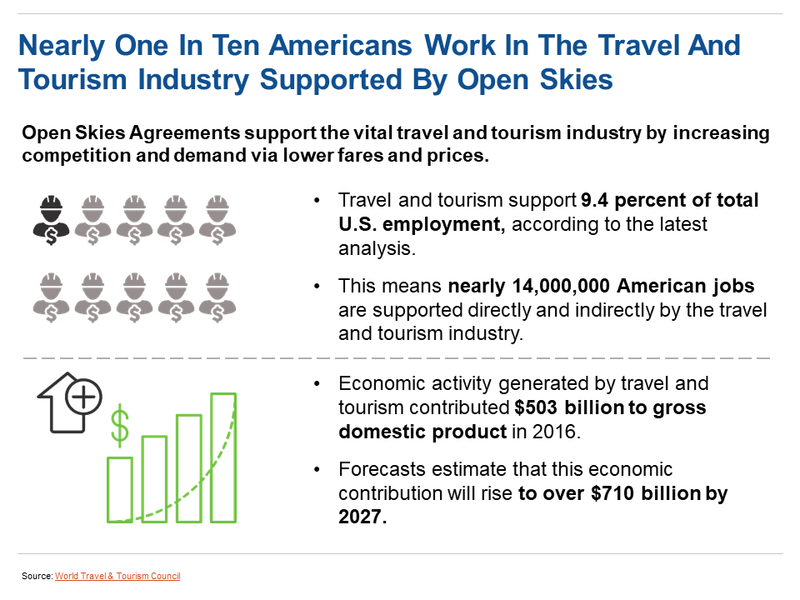 More than 100 U.S. Open Skies agreements have brought millions of new international visitors to the United States, supporting more than 15 million U.S. tourism and hospitality jobs. According to the U.S. Travel Association, 75 million international visitors spent nearly $250 billion in the United States in 2016 alone, benefiting a wide array of travel-related businesses such as hotels, rental car companies, restaurants, and retailers. In fact, according to research conducted by Hawaiian Airlines, adding one daily wide-body flight carrying predominantly foreign-originating tourists can result in $65 million in direct spending, $117 million in U.S. GDP growth, and more than 1,150 U.S. jobs. Open Skies agreements save passengers $4 billion on U.S.-international routes annually and have created more choices by expanding domestic airline routes. Furthermore, the United States’ network of Open Skies agreements has bolstered U.S. national security by enabling carriers to transport U.S. military equipment and troops to and from hot zones, such as Iraq and Afghanistan. Why Do They Need To Be Protected? Despite the multitude of tangible benefits Open Skies bring to America, the legacy carriers – American Airlines, Delta Airlines, and United Airlines – would like to get rid of certain agreements to protect their market share. Specifically, they are targeting U.S. Open Skies agreements with two Gulf states, the UAE and Qatar. This is extremely worrisome as any agreement lost would likely increase prices for consumers, limit flight options, and ultimately hurt the American economy. Many U.S. airlines do not support the legacy carriers’ demands. USAOS member companies, as well as other U.S. passenger and cargo carriers not aligned with the legacy carriers, collectively employ nearly 3.5 times the number of workers employed by the legacy carriers. In addition, Gulf carriers and other foreign airlines not aligned with the legacy carriers bring thousands of passengers to the United States, creating demand for connecting flights on smaller U.S. airlines. These additional passengers enable smaller airlines to expand their domestic services, creating more competition, lowering prices for consumers, and supporting job growth. Where Do These Agreements Stand Now? The Trump Administration is continuing the policies of previous administrations by seeking out new Open Skies agreements, including a recent one with Brazil. Regarding the effort by the legacy carriers to reopen our agreements with Gulf states, in 2018 the State Department announced it would uphold the U.S. Open Skies agreements with Qatar and the UAE. These resolutions put an end to the years-long effort by the legacy carriers to limit access to the U.S. for Gulf carriers. The rights enjoyed by U.S., UAE, and Qatar airlines under the respective Open Skies agreements were not impacted in any way, including the right to provide service between the parties with intermediate stops, known as Fifth Freedom service. Passengers save approximately $4 billion annually on U.S.-international routes thanks to Open Skies agreements. Full air liberalization would lead to a 16 percent increase in air traffic, and support an additional 9 million aviation and industry related jobs. In 2016, the Gulf carriers alone brought 1,700,000 international visitors to the United States, who spent nearly $7.8 billion and supported nearly 80,000 additional U.S. jobs. 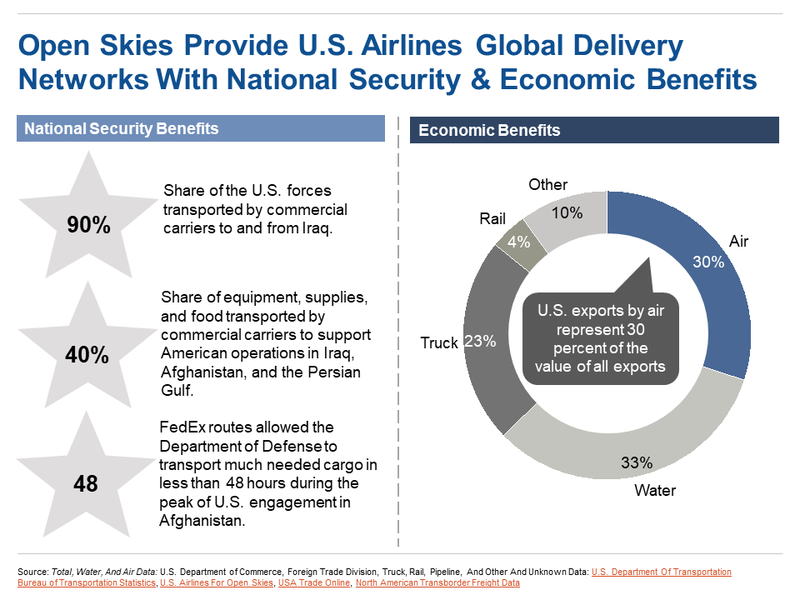 Open Skies allows U.S. airlines to maintain global delivery networks to transport troops and vital supplies for the U.S. military. Since 1991, commercial carriers have transported almost 40% of the equipment, supplies and food to support operations in Iraq, Afghanistan, and the Persian Gulf and more than 90% of U.S. forces to and from Iraq. FedEx operates a Memphis to Dubai flight four days per week, which the Department of Defense (DOD) used to transport within 48 hours much needed cargo during the peak of the U.S. troop surge in Afghanistan. Atlas Air Worldwide transports foods and critical life-supporting items like blood and blood products to support ongoing military operations in Iraq, Afghanistan and the Persian Gulf. Open Skies agreements enable U.S. airlines to grow. Foreign airlines bring thousands of passengers to the United States, creating demand for connecting flights for smaller U.S. airlines. Collectively, USAOS transports approximately 54 million passengers annually, ships nearly 8 million tons of cargo, and employs approximately 480,000. JetBlue Airways also was able to initiate service between Boston and Detroit, a route that was previously served by only one carrier, due to the number of international passengers arriving in Boston thanks to Open Skies. U.S. Airlines for Open Skies (USAOS) is a coalition of four U.S. passenger and cargo carriers – Atlas Air Worldwide, FedEx, Hawaiian Airlines, and JetBlue Airways – in support of the United States’ Open Skies agreements, which promote U.S. jobs and economic growth. Collectively, USAOS members transport approximately 54 million passengers annually, ship nearly 8 million tons of cargo, and employ approximately 480,000 people.